(Governor’s Harbour, Eleuthera, The Bahamas.) The Ministry of Tourism in Governor’s Harbour is set to host their 2nd Annual Christmas Craft Show & Farmer’s Market on Saturday, November 24th, 2018 on the grounds by their offices, located opposite the Governor’s Harbour Primary School. 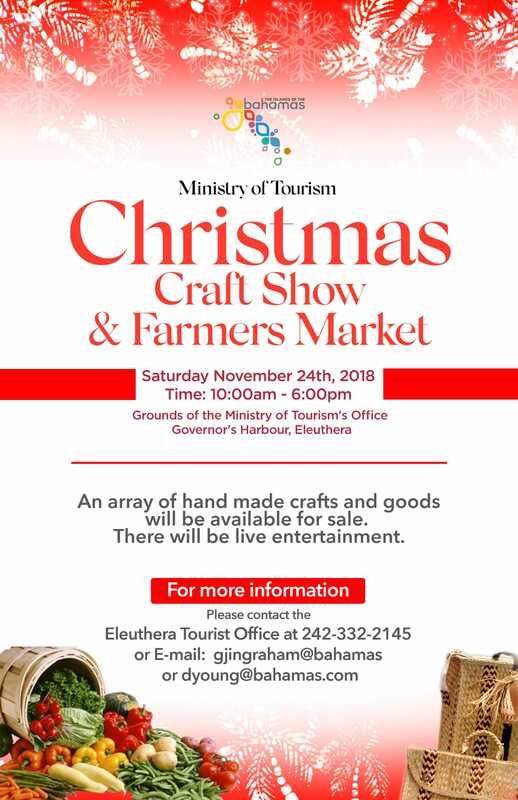 Artisans, craftspeople and farmers from throughout Eleuthera will take part in the show, presenting a one-of-a-kind opportunity to find unique Eleuthera made gifts and treats as well as fresh produce. The show will kick off the holiday shopping season, nicely tucked in between Black Friday and Cyber Monday.